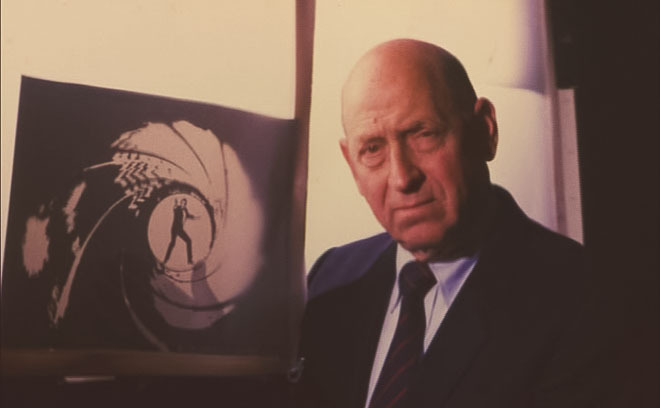 Maurice Binder was a film title designer best known for his work on 14 James Bond films including the first, Dr. No in 1962. He was born in New York City, but mostly worked in Britain from the 1950s onwards. Maurice created the signature gun barrel sequence for the opening titles of Dr. No. He is also best known for his scenes featuring women performing a variety of activities such as dancing, jumping on a trampoline, or shooting weapons. Both types of scenes are trademarks and staples of the James Bond title sequences. He was succeeded by Daniel Kleinman as the title designer for 1995's GoldenEye. Other film titles he designed include The Mouse That Roared, The Grass Is Greener, Charade, Fathom, and Billion Dollar Brain.